Hey ya'll I did not think of doing another build thread after my last one i did for my Samurai. but have been ask by many to start on so here goes. Pictures will fallow once i get them hosted some where. I will get photos up soon and build info. will be picture heavy for a few. dont' sweat it, we like pics but be aware that the photo uploader sometimes chokes on huge files so you might need to spread out the pics into multiple posts. and other times it works just fine. 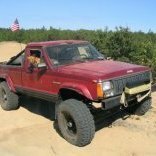 Here is the Comanche on the day i bought it and tore it down. This is about a month after getting it and got the first parts to the house. first set of headers that ending up being to small for the final enigne. First time rolled out side after the 8.8, new front fenders and intake on it. Next came the dash and lots of measurements. All the holes in the fire wall modified and welded up. SO with a 5.3ls, 4l70e, and NP241 t case i needed a new rear cross member, plus i wanted it high ans tight so to speak. All the parts on a table for storage as i collect them. I sent two days getting all the plastic coat off the Comanche to get it read to start body work and paint the it. during this time i also go the 97+door mounted. This gets every one brought o Sep 6, 2017. First tear down was Dec 31, 2016.
cover the intake hole in the hood. If memory serves it is a camaro 4.5 hood steel hood scoop. Then it was on to keeping the tires covered. and making sure all the dents above the finders where straight. I have to give credit where credit is do my Uncle did all the body work in a week on his vacation and painted it for me. I got called to work when i was suppose to be off. I did work every night from 7 to 1 or 2 to get things done. One of which was boxing the tail holes int the back. Yes it needed some filler on the tail light holes and dents from years of being a trruck. Know i will say their is about 130 hrs of prep time in the body and paint. Sorry forgot to get pictures of the scoop install. Know their was a pause to just leave the Comanche this color(sealer primer), but i really wanted it to be blue.. Yes their is a hole for oval lights, i wanted something different and really like a particular oval led light. That and a nice stock replacement was to damn expensive and no one makes new ones that i could find. Now the Comanche was painted on Thursday night. The DIY bead locks where suppose to be at this hose a week earlier so i could have the wheel ready for paint. They showed up Friday. So i spent all Friday night welding bead locks on and Saturday during the day grinding. I hate flat black wheels, so i though body color with black lock rings would new much better looking. Ready for paint, took about an hour per wheel to weld the locks on doing 2 inch welds and jumping around to prevent warpage to the best of m ability. After 7 days of work, thanksgiving dinner Thursday and my father adding a strip to his truck the Comanche is back inside and ready for more love. Two weeks goes buy while i wait for the powder coater to get my bead locks back to me. Then for it was time for rubber, friend at work pulled BFG KM2's off is Dakota for his build to run 40's so i got 33x12.5x15 for a seal. The hood will be close, will probably have to make a new hood prop arm. Time for some sleep will keep working on getting this thing up to date. spent most of tonight making a s bend for the exhaust. showed to be the exact same by the drawings. not the case. lots of cutting and boxing was needed. strength to the rail and uni-body. That is the first notch of two that needed to be made but i will have to get into that one next time. So after seeing the JCR Comanche i really wanted the rear four link for mine that and the extra hp and torq it would eliminate axle wrap. Which was going to be a b*@ch to keep under control. I searched and contracted IronMan4x4fab and asked really nicely about buying a set before they came available. They told me they would get back with me and finally did, ordered a set from them and then talk with them some more for a rough idea how they installed the original set. all that said and done it was time to get to work installing them. Just knowing how i am and really wanting to be able to beat on the truck when done it was time to and some strength to the mounting locations also. holy crap those brackets are just... engineering art! look at all those clean bends! Frame side is now done it was time for the rear end to get some love and links built. Not only are they art the fit as good as they looked. Great quality and great people that built them. After a four link is built then that means new location for the fuel tank and have to come up with a coil over set up that i can live with. My solution is a Aeromotive 20 gallon fuel cell, custom coil overs from a dirt racing shock builder friend, two new customer rear cross members. That and some really heavy duty upper shock mounts. a/c drive it would require more notching on the right rial. with that said i will be adding stiffeners to the outside to the frame rails and all the notches are of 1/4 inch. Speaking of my last project, it got sold three weeks ago to fund this build so i can get it the way i want it. But one toy gets to fund the next toy, all is good. So with all the engine acceceries clearanced it was time to get the bed on it and check so clearances for bigger tires and to see how well i did. The wheels are 4" off set with now spacers on the 8.8 so it is alittle narrow, i am thinking 1.5 inch wheel spacers. Know for some pictures of the whole truck and full compression to build the exhaust for the truck and to show some of the tightness keeping it high and tight. I will get the exhaust crosover pictures up this week end and it all works out have the rest of the exhaust built. I was intrigued right up to the point where you cut the frame for the header, then you lost me. Sorry to hear, but sacrifices have to be made for a vision of big horse power. I think that Driver is referring to using different headers or custom making them. plenty of LS swaps have been done now and some have guys cut the frame for clearance (one guy hacked out quite a bit! ), others apparently didn't need to. I couldn't tell you what the various differences are though. My original headers did not require me to cut but did not come in 1 3/4 primaries. that and they were damn near touching the firewall. I really liked the bigger primaries and the distance from the firewall for the cooler interior temps.